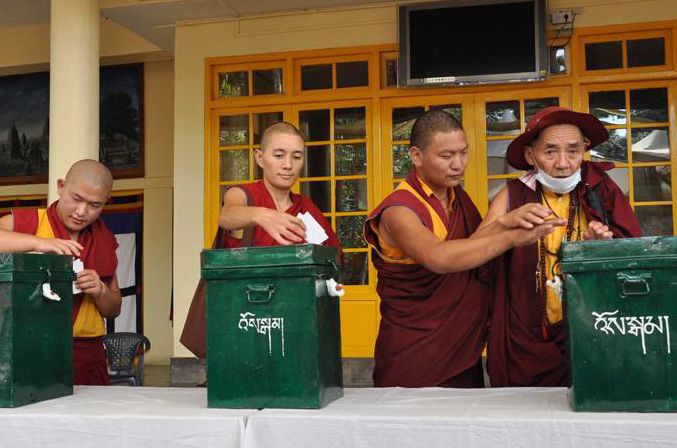 Tibetans living-in-exile cast their vote for the 16th Tibetan Parliamentary preliminary election. (TibetanReview.net, Sep27, 2018) – The Tibetan Parliament in Exile has on Sep 26 rejected a bill to amend The Charter of the Tibetans in Exile introduced by the Kashag (cabinet) of the Central Tibetan Administration, seeking to do away with the first-round voting meant to enable the drawing up of the lists of candidates for the election of the Sikyong and of the members of the exile parliament. It won support from only one member of the exile parliament. Sikyong Lobsang Sangay who strongly spoke in support of the amendment has argued that the long period of 100 days between the preliminary voting and the final poll provided a fertile opportunity for those out to create discord in the Tibetan society, especially agent provocateurs from China’s United Front Work Department and people from a section of Shugden worship groups. Besides, he has pointed out, the winner or the lists of winners in the final election of the Sikyong and of the exile parliament membership have almost always remained the same or overwhelmingly same, rendering the preliminary poll redundant and costly. However, members of the exile parliament at the ongoing Sep 18-28 session argued that the two rounds of elections was needed to enable the public enough time and occasions to gauge and consider the background and capability of the candidates or potential candidates.